The President Sanders film festival is an opportunity for local filmmakers to present their visions of what America would have been like with Bernie in charge. With the presidential inauguration looming before us, an East Williamsburg art gallery is laying the groundwork for a film festival dedicated to the exercise of envisioning a Bernie Sanders presidency. The President Sanders film festival, which is organized by Ten Eyck street art gallery, photography studio, and event space Studio 301, invites filmmakers to submit short films "set in a world where Bernie Sanders won the election." Between now and July 31, political auteurs can submit short films running 12 minutes or less for consideration for the festival, which will be held in September. There is no submission fee for the festival, and the festival organizers say they will respond to applicants to the festival within a week of their submissions. The lineup of 10 to 15 films will be announced in August, and an as yet undetermined prize will be awarded to the film that places first in the festival (awards will go to the second and third place contestants, too). How literal, or figurative, do these imagined Sander presidencies have to be? That's up to the entrants. "The film prompt can be interpreted however they please," explains Studio 301's Amanda Mercado. Do you wish you had a student debt free future? Maybe you want to share your vision for a New York City without income inequality? Perhaps you just really wanted to try that ice cream flavor Bernie inspired, or had a great time at one of Bushwick's many wild Bernie fundraisers this past spring. Submissions to the festival can be uploaded to YouTube, marked private, and shared with fishsmokerfilmseries at gmail dot com for consideration in the festival, and questions about the fest can be directed to amanda dot 301studiosnyc at gmail dot com. 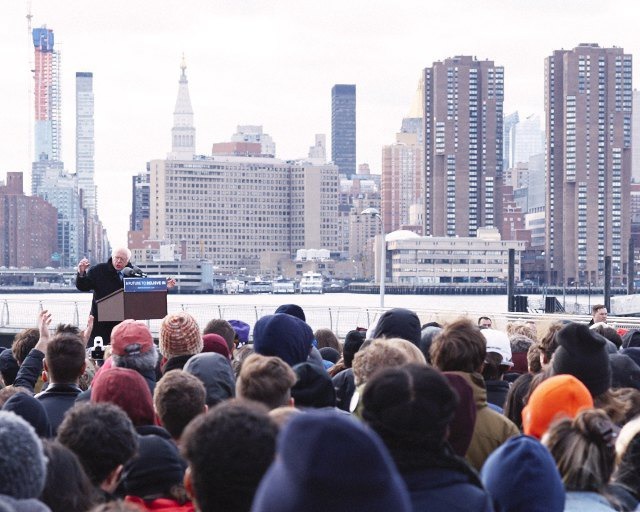 Featured image: Bernie Sanders speaks to Brooklynites on the waterfront in Greenpoint shortly before New York's 2016 democratic primary. Alonzo Maciel for Bushwick Daily.